Wanting to get a boat, we put our name on the waiting lists for ‘wet’ or ‘dry’ slips. After a few years, the call came – our name came up for a slip. It turns out, the slip I was assigned could accommodate a boat up to 28-feet (from tip-to-tip.) I went shopping and found a 27-foot Ericson; more of a cruiser, rather than a racer. I call it a bathtub in the water; it is definitely not a speed-racer. Anyway, the boat was called “Ballou Hawaii;” I had to change the name. However, since the beginning of time, sailors have sworn that there are unlucky boats and the unluckiest boats of all are those who have defied the gods and changed their names. Fortunately, there are ceremonies that one can use to appease all. According to legend, each and every vessel is recorded by name in the Ledger of the Deep and is known personally to Poseidon, or Neptune, the god of the sea. Some people might not know that there is a formal ritual in name-changing a boat; actually, there are several rituals. If you wish to change the name of your boat, the first thing you must do is to purge its old name from the Ledger of the Deep and from Poseidon’s memory. It is usual for the renaming ceremony to be conducted immediately following the purging ceremony, although it may be done at any time after the purging ceremony. I try to get to the boat every weekend. Sometimes, I would just go down and “fix” stuff; most often, though, I try to go out for a sail. It’s rigged for easy single-handed sailing (Nelia goes out only occasionally,) so I can raise/lower and control most of the lines and stuff from the cockpit. I hope the weather and wind are favorable this weekend; I’d like to go for another sail on the Bay. The image shows Mokuone at her mooring. 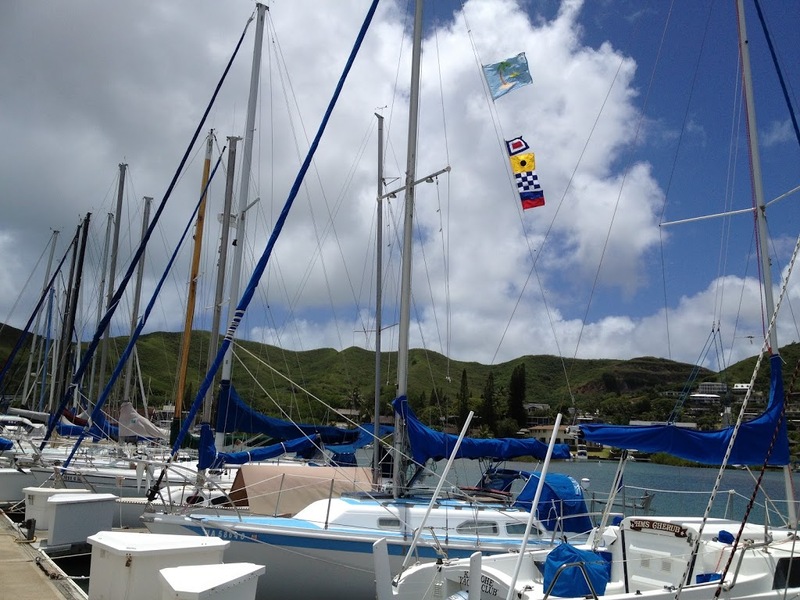 I raised the boat’s flag, as well as my own nautical flags. Today is the 4th anniversary of getting the boat.